This entry was posted on June 17, 2015, in Connection, God, Illumination, Presence, spirituality and tagged awakening, Divine, Faith, God, Inner beauty, Light, Love, Source, spirituality. Bookmark the permalink. When I was 17 yrs old I had an experience that I will be eternally grateful for. I was selected to be a part of a team of youth in a summer camp environment where we presented ‘talks’ to kids and other youth on a variety of topics. There was an incredible amount of creative license afforded to us by the adults who administered the program. We were able to select the topic and create all the content with no outside shaping. This allowed the unbridled imagination of youth to emerge forth in a discussion of the world from a largely unjaded mind. Having had, what can only be called, a spiritual awakening the summer prior, I had an undeniable knowledge of God/Spirit/Source (etc) that transcended all I had been taught in my religious upbringing. Therefor the majority of the topics I chose centered on issues related to self-esteem (surprise,surprise) and spirituality. Now, 23 years later, I find myself reflecting on the young wisdom of one of those summer talks. That summer, I sat in a room of about 20 of my peers and told them of their unquestionable and unshakable inner beauty. I spoke of a Divine Light that existed at the core of all of us, one that could never be extinguished and that never abandoned us. I shared the perspective (that I believed but often had trouble accessing myself) that none of us had a brighter light than the other. I remember feeling as though something else was doing the talking, like I was being used to convey a message from something outside of myself that lovingly needed to reach those babies. As I spoke, I saw in them a yearning to believe the words and a glimmer of hopefulness in their eyes. It was as though something inside of them resonated and recognized the truth of the message even though their real world reality was possibly trying to convince them otherwise. Now, years later, I find myself here at the computer compelled to share the same message. We can be so constant with our comparisons and we can mistakenly believe that ‘they’ have something we don’t, ‘they’ are special and we simply aren’t enough. This robs us of our personal power and robs the world of our Light. The truth is we are and will always be more than ‘enough’. We are all that is. We are that Divine Spark I spoke of years ago and it burns just as brightly within each of us, only some of us have a clearer view to it than others. Some of us see and know our Spark and some of us have forgotten it or have been taught through life’s hard lessons that it doesn’t exist. Our task, our daily calling, is to remember that Light within. To not only see it and feel it in ourselves but to recognize it and search it out in others. Living from this place of knowing that we are Light is the definition of pure joy. It is believing that life is here as our playground; meant for fun, beckoning us into peaceful play. It is plugging ourselves in to the glorious realization that we are loved and that we are LOVE. Now and always. 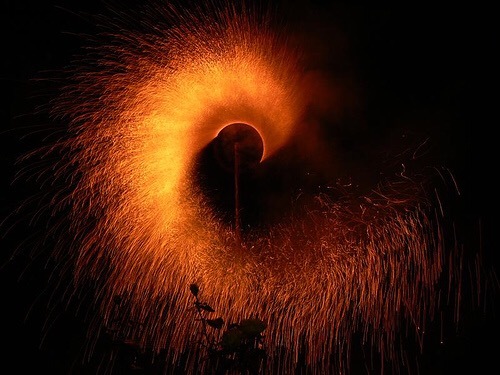 It is perhaps not realistic nor possible for all (but a few of those enlightened masters) to hold that awareness all the time but if we can only recall, in those darker moments, that the spark is still there, burning steadfast, it can offer us comfort and trust in Life.